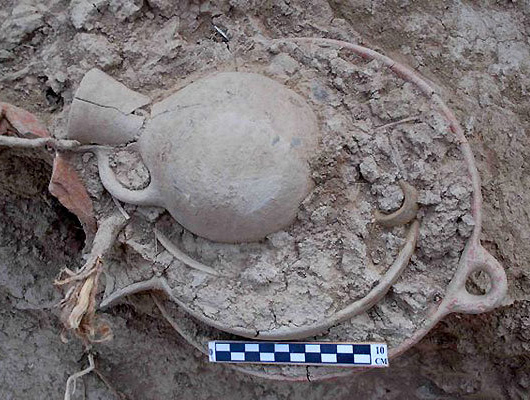 A number of pottery objects have been found during excavations in an Iron Age cemetery hill in Qazvin with a new ancient tomb emerging from underground. A local archaeologist of the Cultural Heritage Research Centre and the head of a team working on delimiting the cemetery hill in Qazvin alluvial plain told reporters on Saturday that they had been excavating the site in 68 places with depths varying between 1 and 6 meters. “Our present excavations roughly found more or less the same delimitation for the site,” Nowzar Heidari told the press, as reported by Mehr. Heidari also added that the widening in the northern side will be the least with most widening in southwestern side of the site. “Excavations uncovered pottery in good conditions; a new tomb was excavated to examine whether the newly-found tomb is part of the older tombs excavated earlier, where we found that it was part of the Iron Age cemetery and had not been discovered for a long time,” he said. “Agricultural activities and irrigation mode have damaged the sepulchres, with most bone parts irrevocably lost,” he concluded.